Summary from Goodreads: From New York Times bestselling author Kristina McMorris comes another unforgettable novel inspired by a stunning piece of history. 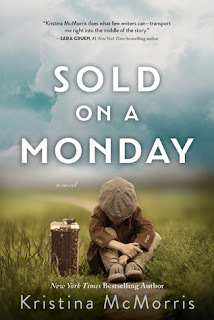 “A vivid and original story... McMorris brilliantly chronicles the way in which a moment's fateful choice can result in a lifetime of harrowing consequences. A masterpiece that poignantly echoes universal themes of loss and redemption, Sold on a Monday is both heartfelt and heartbreaking." Review: Historical fiction is one of my favorite genres and to know that this book has some basis in reality, is truly heart wrenching. It starts with a photo, one that has been seen millions of times over the years. This story was so wonderfully written that I had a heard time putting it down. Amidst the great depression, parents did what they could to feed their families, even selling them so they could live. The book dives deeper into the lives of these people and the people around them.